Daniel Rowland is a Zimbabwean long-distance trail runner who competes in ultramarathons and multi-day stage races around the world. Daniel has his own blog (www.dwrowland.com), where he shares his process of preparing for stage races based on his own experience. 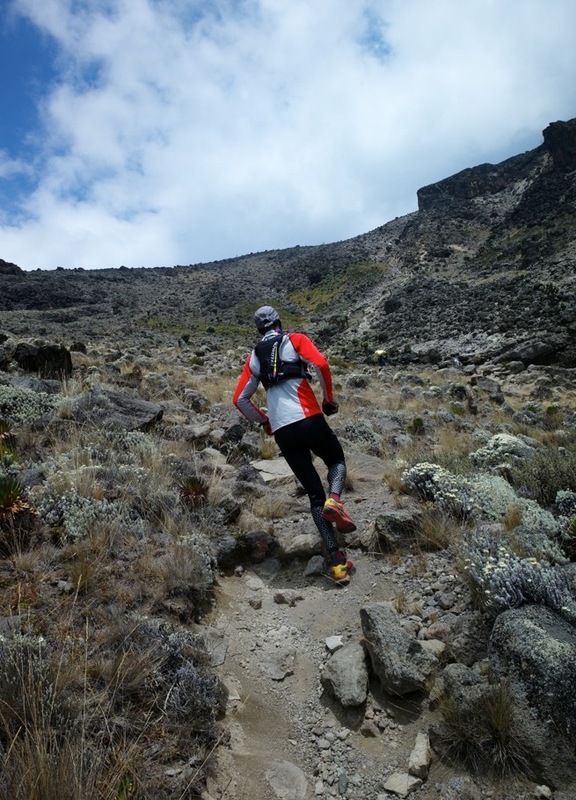 It is “a guide to multi-stage racing and mountain ultras” from a runner who knows what he is talking about! Daniel allowed us to re-post one of his blog articles that is particularly useful for KSR runners – taking care of your feet during an ultra running event. 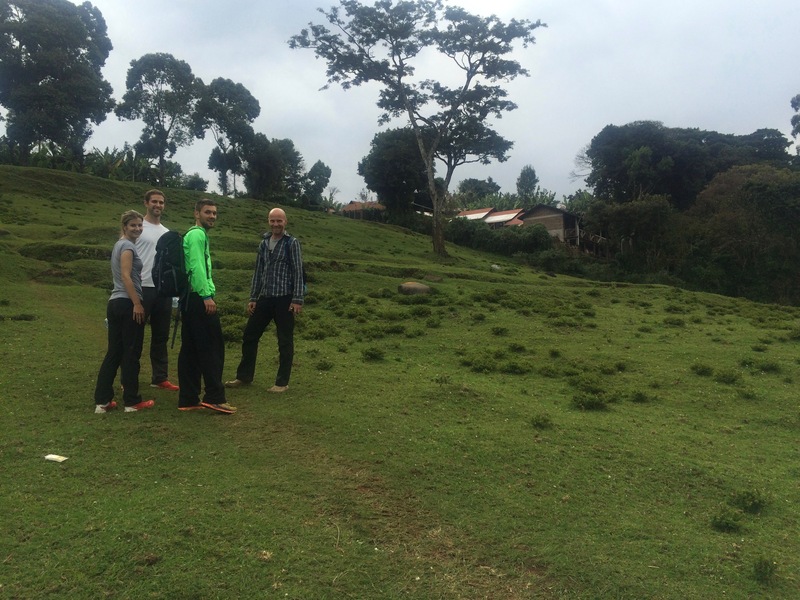 “Our feet will be strained and tested during the course of an ultra. Depending on cadence and the time to complete a race, each foot will hit the ground between 150,000 to 200,000 times (a cadence of 90 footstrikes per minute for a 30hr race). That’s a lot! Each foot strike results in an interaction between the foot, sock and shoe and when those interactions are not perfect there is a likelihood of issues developing. Even a tiny inconsistency in the interface between foot, shoe and ground will be exacerbated by the high frequency of movement and can lead to problems later in the race. The most common problems that occur are blisters and damaged toe nails (which are often the result of blisters under the toe nails). Blisters are the result of one, or a combination, of the following factors: heat, friction and moisture. These factors are common when running and frequently lead to blisters. In a multi-stage desert race the probability of blisters increases and the severity of the damage often increases too. This is because the race environment is hot and sandy so there is more danger of moisture developing due to sweating feet and friction can be greater due to fine sand entering the shoe. In addition to the environment, running with a pack places more weight on the feet so the intensity of friction can be higher leading to blisters developing more quickly. The second issue in a multi-stage, self-supported race is the severity of blisters. Competitors have to treat the blisters themselves usually with inadequate medical supplies and in camps that are not very hygienic (compared to a clean bathroom or kitchen at home). Competitors are also on a restricted and low-quality diet and their bodies are under extreme strain so the natural defense mechanisms of the body and immunity are compromised. It is a downward spiral of conditions that needs to be carefully avoided. Over multiple days these factors can cause blisters to become infected which is one of the leading causes of abandoning multi-stage races. 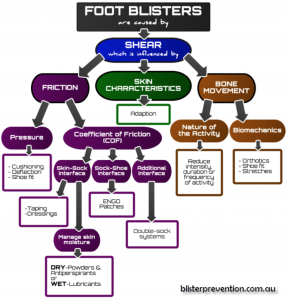 A useful flowchart for diagnosing blister issues from Blister Prevention. A proactive approach to foot care is important as this will prevent any issues from arising in the first place – a prevention is better than a cure! I know from previous races and from long runs in training where I have issues with blisters and what environment factors affect me. It would be naive to assume that in a race, where the impact and stress on the body are far greater than in training, that these issues won’t arise again. The goal of prevention is to avoid facing the factors of heat, friction and moisture that cause blisters. The first level of blister prevention is to ensure that the running equipment for the feet works efficiently and is appropriate for the runner. Firstly it is important that shoes fit the feet properly. Choosing the right size shoe that feels comfortable, that has sufficient room in the toe box for the toes to move and that allows the foot to breathe is key. Everyone’s feet are different and certain brands fit well and feel comfortable while others may not. Some people also struggle with their feet swelling during long, hot races so they may want to take into consideration going a size up for their race shoes. Secondly, good socks provide a layer of protection between the foot and the shoe. Socks that wick moisture away from the foot are a priority as this removes a potential cause of blisters. Socks need to fit well and not compress the toes or foot too tightly while also not being so loose that there are wrinkles or seams forming in the sock. Thirdly the use of foot lubricants can remove any sources of friction. If a runner knows where a hot spot typically occurs, using lubricant (such as body glide) can prevent this from rubbing and forming a blister. The second level of defense is taking additional actions to look after our feet or to increase the amount of barriers between foot and the factors causing blisters. Looking after the feet regularly during training and a race will make them less susceptible to blisters. This could include removing callouses (blisters that form under callouses are usually the most painful and difficult to treat), using a cream to keep the foot soft and supple, staying hydrated so the skin of the foot is not dry, and trimming nails so they don’t catch on the inside of the shoe. These are long term actions to undertake leading up to a race so that foot health is optimal going into the race. Increasing the barriers between the foot and the shoe and the outside environment may also be necessary. Options include taping the feet on blister prone spots so that the tape will provide an additional barrier and wearing gaiters to provide an additional barrier to debris entering the shoe. My routine is to look after my feet well during the 8 weeks leading up to a race. I file away callouses, use a foot cream and trim my nails regularly. I believe that a soft foot with supple skin is the best option for me to avoid blisters. I wear high-quality moisture wicking socks and shoes in my regular size (I have not had problems with my feet swelling). I always tape the ball of my foot and my large toe before races as this is where I am most susceptible to blisters. Finally, for desert races I wear a full gaiter that covers the entire mesh part of my shoe to keep out the fine sand that can be so infuriating and which easily passes through the mesh of most shoes. When proactive measures don’t work, then it’s time for a reactive treatment of a blister. There are many different opinions on how best to treat a blister. This is what I do. If a blister is small, doesn’t irritate me and doesn’t look like it will grow then I prefer to leave it as it is. The skin is the best protective layer and leaving the blister sealed prevents any risk of infection or foreign body entering the foot. This is an easy and simple solution! finally, before running I cover the blister with paper tape (so the skin is not exposed to the adhesive of elastic tape which could tear and remove the skin at the end of the day) and then complete the taping with elastic tape over the area. After the next stage I will repeat any of the steps of the process that are required. Some people like to remove the entire layer of skin that formed a blister (common at the Marathon des Sables). I don’t like this idea at all and would prefer to leave the skin on my foot to protect the tissue underneath rather than relying on tape to provide a layer of protection. I have found the book Fixing your Feet by Jon Vonhof to be useful and provide a great guide for taking care of my feet. My prevention and treatment procedures above are guided by some of his ideas and my experiences, and I think are sufficient information to look after your feet. However, if you are struggling with issues or need more detail I recommend Vonhof’s book. Thanks Daniel for letting us share your post!